The exotic form of this bed was inspired by Chinese pagodas. The design and the pierced fretwork back are similar to garden tea pavilions built in the Chinese style and found in large gardens throughout Britain and Europe from abouat 1730. Chinese decoration was particularly popular for ladies' bedrooms and dressing rooms. Although the payments for the bed and other bedroom furniture were made jointly by the 4th Duke and Duchess of Beaufort, evidence in the Duchess's private notebooks shows that she was particularly interested in this commission and probably discussed the details with the designer and craftsman John Linnell and his father William Linnell. The bed hangings had been replaced with scarlet woollen hangings by 1835, although the bedding still included the original 18th century hair mattress which was acquired with the bed by the Museum in 1921. In addition there was a feather bed, three blankets, a wool mattress, a straw paliasse (another form of mattress) and a Marsella quilt. In 1929 a replica of the bed was made for the Chinese Bedroom at Badminton House by Angell of Bath. 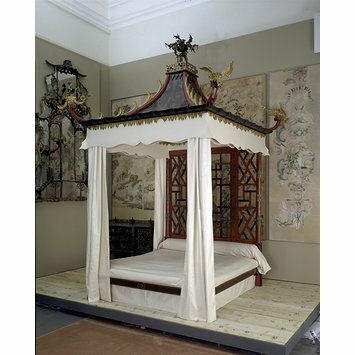 Bed in the Chinese style, with slender carved posts and a fretted backboard holding up an elaborate tester in the shape of a pagoda surmounted by gilded dragons. One wing of the dragon on the front right as you look at the bed has been replaced by the museum. Commissioned by the 4th Duke and Duchess of Beaufort for the Chinese bedroom at Badminton House, South Gloucestershire. Probably designed and supplied by the workshops of William and John Linnell, Berkeley Square, London. This was one of the earliest 'bedroom suites', with other items of furniture made to match. The V&A also holds a cabinet from the set (W.55-1952) and two armchairs (W.33 and W.34-1990). The commission came at a time of fashionable interest in Chinese styles. The year before the bed was commissioned, in 1754, an engraving was published showing 'A View of the Mandarine Yacht and Belvedere Belonging to His Royal Highness the Duke of Cumberland at Windsor'. The 'Mandarine Yacht' had a pleasure pavilion on it with a striped roof, turning up at the corners, the sides with pierced and trellised panels, and the deck of the yacht had rails trellised in Chinese style. The hull of the yacht, above the water, was painted with a dragon. It sailed on the Duke's lake at Belvedere, Windsor. Offered for sale at Christie's, 30 June 1921, lot 76, but bought in. It was subsequently bought by Moss Harris & Sons and offered to the Museum for £400 (Nominal File: MA/1/H857). 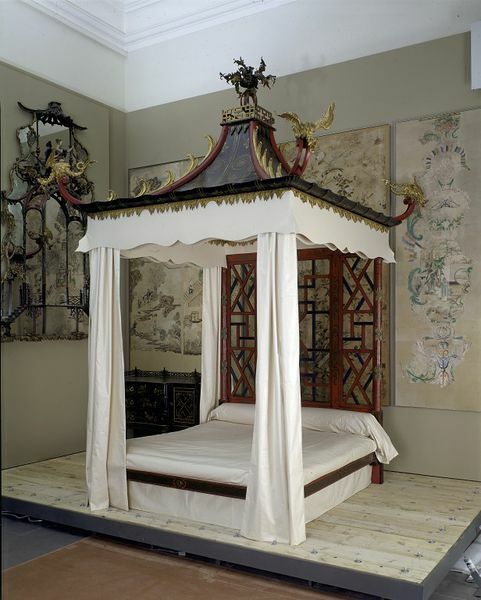 This bed came into the collection at a time when there was considerable interest in Chinoiserie decoration. In 1920 the well-known designer and furniture historian Percy Macquoid had designed a suite of bedroom furniture in lacquer for the manufacturer, Sir Arthur Crossfield's house, Witanhurst, 41 Highgate West Hill. The decorating firm of White Allom & Co. were commissioned to decorate and furnish the house and Macquoid made designs for them. The following year the V&A acquired another bed in Chinoiserie taste (W.451-1922), but the origins of that bed are so far unknown. Museum negative 74591 shows this on display in Gallery 40 in 1936 as part of a display of Georgian furniture. Macquoid, Percy, A History of English Furniture, vol. IV, The Age of Satinwood, pp. 13-17 fig. 9. London and New York: Lawrence & Bullen, and G.P. Putnam's Sons, 1908.